A recent discussion about ANTIFA and its viability brought an interesting article from History Today, to my attention. User Jondwhite shared it as they believed it supported their overall point that physical resistance isn't effective. 1 The article does give that tone though I'm not really sure that was what the author was going for. However, I do think its worth reading and I especially think certain sections of it are really important even if the author doesn't seem to have been fully aware of the implications. However that isn't the full picture and the part that's overlooked in this narrative I think is the really important dimension in the argument of whether victimisation is real and what role it actually plays in our responses to Fascism. In this context Cable Street simply thrust the BUF back into the limelight after two years of relative national obscurity and provided it with a stage on which to play out its claims of victimhood. This, Mosley argued, had been a perfectly lawful procession, sanctioned by the authorities. The East End housed the core of his supporters. They had every right peacefully to express their political beliefs, yet had been forcibly prevented from doing so by a disorderly mob. This portrayal of events clearly struck a chord with many locals. In an internal document the Fascists observed that the ‘strong sense of local patriotism’ in the East End had been ‘gravely offended by the rioting of Jews and Communists last October ... [which] was felt as a disgrace to the good name of east London’. The bit in bold is I think the key here, they experienced growth not out of a sense of general sympathy and love of freedom of speech, but anti-Semitism. The East End was the part of the UK with the largest Jewish community and the area with most racial and anti-Semitic tensions. This is why Moseley chose the route of the march in October to go straight through predominantly Jewish neighbourhoods, the party had embraced a platform of xenophobia and anti-Semitism and it wanted to win support from the hostile local "native" British population. Mosley’s adoption of anti-Semitism in 1934 was from the outset portrayed not as a choice but as a move forced upon him by Jews themselves. ‘Small’ Jews had attacked the Blackshirts in the street and invaded their meetings, while ‘big’ Jews financed the anti-fascist movement and used their wealth and influence to turn the media and government against the BUF. It had also become clear, Mosley alleged, that Jews were the power behind Fascism’s two chief adversaries: international finance and Communism. Even the article supports the assertion that this post-Cable Street growth was tied heavily to exploitation of anti-Semitism by the BUF. Cable Street – the most substantial manifestation of Jewish anti-fascism to date – fitted the BUF’s narrative perfectly. The internal publication mentioned above noted with satisfaction that ‘the impudent use of violence ... to deny east Londoners the right to walk through their own part of London ... [had] sent a wave of anti-Jewish resentment’ through the area. Speakers were advised that propaganda should take advantage of this fact. The demonstration was immediately branded by the BUF as ‘Jewry’s biggest blunder’, while the police were accused of ‘openly surrender[ing] to alien mobs’. It was claimed that ‘financial democracy’ and ‘Soviet-inspired Communists’ had colluded to inhibit legitimate activity by ‘British patriots’ in the East End. As a result, the district had in effect been ‘handed over ... as the Jews’ own territory’. It was time, the BUF declared, for the true British people to reclaim their land. Such appeals were well received. Special Branch recorded that among the cohort of new Fascist recruits were a ‘large number of gentiles with grievances against the Jews’. However the case is more substantial, the post-Cable Street growth of the BUF was almost exclusively limited to the East End of London. Its branches outside of it seem to have continued to stagnate or collapse. The article quotes an Exeter BUF member remarking about Cable street "now we have active opposition in Exeter I think we shall make great progress there" but that doesn't seem to have been the case at all. The BUF didn't see much of a revival in Devon, its peak in the area was a 1,000 strong branch in Plymouth which collapsed in 1934, Exeter never exceeded this, the most high profile event they managed in this period seems to have been a speech by Mosley in 1937 which had an attendance of around 1,500. But despite his speech viciously attacking Jews and happening in the aftermath of Cable Street and the local BUF having to resort to police protection from anti-fascists it doesn't seem to have led to much of a revival of BUF fortunes. So if the violent confrontations in Cable street were so disastrous for anti-fascism because they gave the BUF its victimisation validation, why the drastically different fortunes in different parts of the UK? 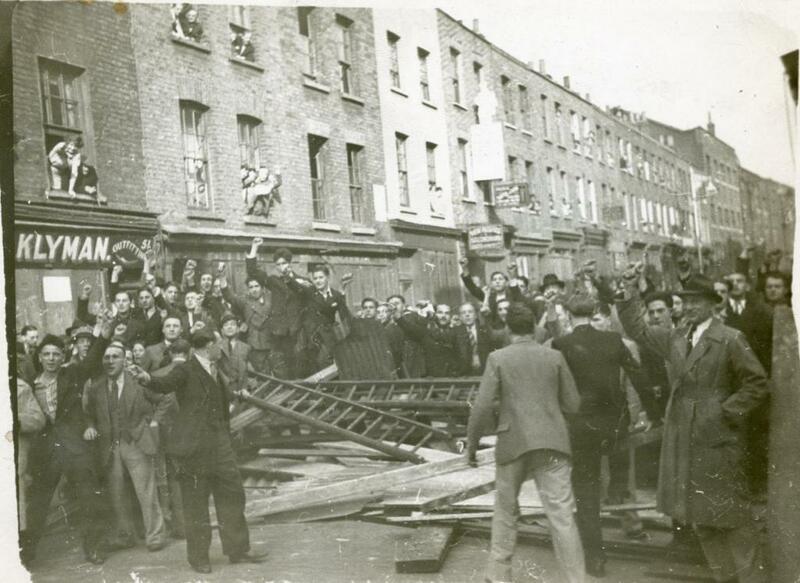 The fighting on Cable Street was filmed, photographed and recorded and became national news, that's partly how its become so iconic, so we should've seen a general trend of revitalisation but at best we see a localised surge and continued stagnation elsewhere. The only real difference is the fertile soil the BUF's anti-Semitic platform could find in the East End but it wasn't as attractive a message elsewhere. If violent confrontation and victim framing were the key then the BUF would have been far stronger as a national organisation as it faced direct opposition in nearly all localities that it had a presence in, but in many areas the pressure and defeats seem to have proven the Exeter Blackshirt wrong; they didn't make great progress at all. There is another plank in this argument though, the events two years early at the Olympia Hall meeting. A group of anti-fascist protestors including Vera Brittain, Richard Sheppard and Aldous Huxley managed to get into the meeting and started heckling Moseley. In response Black shirt stewards physically assaulted many of them and ejected them. Several of them were severely injured, it was what we now call a PR disaster for the BUF. A lot of their respectable supporters like the Daily Telegraph which had been rather kind in its coverage previously distanced itself. "A young woman carried past me by five Blackshirts, her clothes half torn off and her mouth and nose closed by the large hand of one; her head was forced back by the pressure and she must have been in considerable pain. I mention her especially since I have seen a reference to the delicacy with which women interrupters were left to women Blackshirts. This is merely untrue... Why train decent young men to indulge in such peculiarly nasty brutality?" After the Olympia meeting, for example, although respectable supporters abandoned the BUF in droves, there was also a short-term influx of new recruits angry at attempts to silence Mosley. What we have here with Olympia is another example of an event affecting different sections of the population differently. People who agreed with the BUF's then largely economic platform but weren't ok with the BUF's increasing violence or growing anti-Semitism left the party, but in exchange it attracted people who were on-board with this political realignment. The same thing happened after Cable street, a large mobilisation against the Jewish community and a demonstration of the power of that community attracted thousands of anti-Semites to the BUF. This is the crux of the victimisation narrative: its not that a far-right movement is losing a fight that attracts some people to the far-right. It's that in getting into a fight and losing to a minority group or radical leftist current they are appealing to and alarming that segment of the population that largely agreed with them anyway. Local Anti-Semites rallied to the BUF in the aftermath of Cable street because they saw it as a champion of their interests and their community. So the real lesson of Cable Street seems to be that if you see a group of violent reactionaries getting driven off and you feel sympathetic for them and not the community they were terrorising then you're probably a fellow traveller yourself. The evidence seems pretty incontrovertible on that point. 1. I'd like to thank Jondwhite for sharing this article. Not only was it very interesting but it marks the first time I've seen someone provide substantiation to this claim. For several years now (I wish I was kidding) I've encountered dozens who make a similar claim, but they never bother attempting to prove the point. Great piece, Reddebrek. Just to let you know, I've corrected a few typos and also changed 'BUF' to 'fascists' in the title as not all readers might be familiar with what the BUF was. Your point about the importance of anti-semitism is a good one. I think people tend to forget that 1936 (before Cable Street) had seen an increase in anti-semitic violence more generally and that was what Mosley hoped to tap into. Two other things which are also forgotten was that the post-Cable Street recruitment was very transitory (many leaving the BUF not long after joining) and that there was also an increase in recruitment for the far-left. So the idea that Cable Street turned more people fascist is untrue; it was part of a wider politicisation in British society. More generally though, I wonder whether left-wing histories of Cable Street do actually say it was a decisive victory against British fascism. I don't remember ever reading that (though I admit it's possibly a problem with my memory more than anything else! ), more that it was a huge and iconic one (which, especially against the backdrop of rising anti-semitism in East London, was probably a relief for local residents). I can't imagine how cowed the Jewish population of the East End would have felt if a rising tide of racist violence was followed by having to hide indoors as fascists marched through the neighbourhood. First off, great blog again, thanks for writing/posting. And yeah your central point is a great one. While reading the History Today article, the phrase which popped into my head was from GCSE science: "correlation doesn't imply causation". Simply stating that the BUF grew after Cable Street, doesn't mean that it grew because of Cable Street. As you say, for their even to be a shred of evidence that violent opposition to fascism helped fascism grow, at the very least the article would have to demonstrate this pattern repeating in other geographical areas. And there are plenty of examples which could have been examined. For example in addition to the ones you mentioned: Stockton in 1933, Manchester 1936, Liverpool 1937, Devon 1930s. And that's not to mention the post-war battles by the 43 group and 62 group which the article doesn't look at either. And of course all these examples counteract even the argument of correlation between opposition and growth, let alone prove causation. Overall a very poor bit of scholarship. Thank you for the kind words and extra info. I think what really undermined the article was the author quoting the Exeter BUF leader, since its clear they didn't bother to examine if they were correct and only added it to make there argument seem more concrete. The final sections seemed to be somewhat victim blaming too when it talked about the rise in anti-Semitic assaults in the East End. It seems like the real culprit was the fact that the area had strong anti-Semitic tensions and a political party that was open to violence actively trying to encourage and exploit those tensions, not the defensive actions of the local Jewish community. There was something I wanted to bring up but couldn't find the footage until just now. I remembered as a teenager I watched a documentary on Mosley that showed footage of him being attacked in the 60's. It even had a narrator "They cried out down with Mosley, and down he goes". He's an old man at this point and he just walks a few steps before getting jumped. I think this footage being in the back of my mind is why I've never really had much patience with this creation of sympathy argument. If an old man getting knocked down on television didn't inspire the nation to rally around the would be Fuhrer then why would scenes of overtly threatening right wing types do the trick?